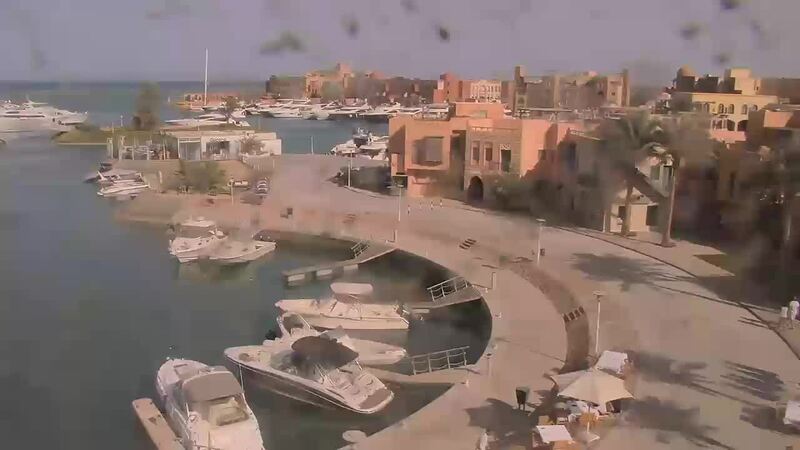 Livestream Abu Tig Marina - A nice livestream from the yachting port of El Gouna. Hurghada: Beach of Hurghada, 13.4 mi. Soma Bay: Soma Bay Beach, 42.8 mi. Soma Bay: Seaview, 42.9 mi. Sharm el-Sheikh: View of the Red Sea, 49.2 mi. Dahab: Kite Lagoon, 89.5 mi. Dahab: Live from Dahab, 89.5 mi. AIDAprima: View from the Port Side, 166 mi. AIDAprima: View from the Starboard Side, 166 mi. This webcam El Gouna with the theme Harbors was added on February 4, 2015 and is operated by Egypt Tourism Authority. It got 18175 visitors since then. Shouldn't this webcam work or should the link be wrong please report that here. You can add this webcam here to myCams.